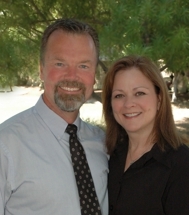 Ron & Brenda Cunningham have been Realtors in the Phoenix Metro Area since 1987. They have been recognized in the July 2010 Phoenix Business Journal as one of the top 50 Realtors in the valley! Ron and Brenda Cunningham enjoy every aspect of Real Estate and have been recognized by various "groups" in the industry over the years. They are members of the President's Club, the Multi-Million Dollar Producers, The top 5% of agents in sales, Voted by Brokers from the different Brokerage firms to be honored and written about in the industry's "Realtor Magazine" for their outstanding values, ethics, & performance, and most recently they were recognized as one of the top 50 agents listed in Phoenix Business Journal! This is out of over 40,000 agents! But to them, their biggest honor is when their clients refer their friends and family, which shows them that Ron and Brenda have done an outstanding job and won their client's total confidence! This is what is important to them, and the best compliment they could receive! Now it is "all in the family" as their Son, Lee Cunningham, and their Daughter, Tara Keator and her husband Mike Keator join the team! What a great team they make! Ron and I have been involved in Real Estate since 1980. We have been involved in Real Estate in the Phoenix Metro area since 1987. We work mostly with repeat and referral clients and consider working with people in Real Estate a real joy. We work with a wide variety of clients from first time homebuyers who have a great need for our help through every step of the way, to move up buyers, sellers, high end listings, investors, banks, short sale listings as well as luxury homes. We are committed to give excellent service to our clients! We can aid our sellers by helping them to lightly stage their listings and provide professional photographs to aid in the sale of their home. We upload listing information and videos to over 50 internet sites for maximum exposure and get their listings to the first page of google. We work together with sellers to accurately price their home so that the home does not just sit on the market and not sell due to improper and overpricing of the listing. We provide as much help as possible to our buyers and are with them through the entire transaction, including the inspections, and we attend the closing with them to be sure there are no last minute problems that we need to help with to prevent any unnecessary delays. We give buyers all the information they need to make wise and safe decisions during the home buying process! We also encourage our clients to contact us over the years with any questions they may have in Real Estate; if we can't help you with your question, we will find out who can!! Brenda rocks! She's a born-people person who loves her craft and knows her territory. When Brenda and I met back in '99, she quickly figured out what I was looking for in a home and took me to it within days. I would highly recommend Brenda to anyone as their real estate agent and will call upon her exclusively as my own. Brenda has helped me buy two houses. One for my family and one for my parents. She was very patient and helpful in finding just the houses we were looking for. We appreciate her continued communications with us over the years and will definately use her again. I recommend Brenda to anyone interested in buying a house or business.